Grand Jury Indicts Church Employee for Theft, LIVINGSTON, June 29, 2018 - A former employee with First Baptist Church of Onalaska has been indicted by a Polk County Grand Jury and is being charged with two counts of theft. 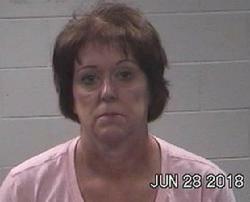 Linda Lucille Vincent, 53, of Onalaska is facing second degree theft on both counts. Vincent was booked in to Polk County Jail on Thursday (June 28) and posted bond later. Vincent is alleged to have stolen from $30,000 to $150,000 allegedly during the time period between January, 2010 and January 2017. Pastor Allen Bramlett of First Baptist Church, Onalaska had no comment regarding the case. The case has been referred to an outside prosecutor (Liberty County District Attorney, Logan Pickett).